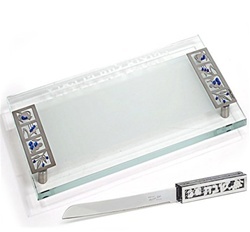 This challah board and knife are made of crystal with metal borders displaying the seven species, with either blue or clear stones. The artist is Anat Mayer, a distinguished Judaica artist in Israel. The Challah Board is 46 x 25 centimeters, and the challah knife is 31 x 31 centimeters.